Euro MPs have backed plans for more uniform food labelling in the EU, but they rejected "traffic light" colour coding of foods. MEPs opted for Guideline Daily Amounts (GDAs), instead of red warning labels for foods seen as unhealthy because they are high in fat, sugar or salt. Some food producers lobbied intensively against colour coding, fearing it would demonise their products. The MEPs' vote could lead to new food labels in three to five years' time. The leader of the UK Labour group in the European Parliament, Glenis Willmott, said that despite the rejection of "traffic lights" the new rules "make it clear that we won't stand for people being misled by food packaging". Key nutritional information, including salt, fat and sugar content, will have to go on the front of the pack. EU government ministers will now consider the legislation, and more amendments are likely. Country of origin is another area where MEPs and the European Commission feel that food labels are often misleading. Some British MEPs are unhappy that Danish bacon, for example, is sometimes labelled "UK produce" even though the pigs were reared in Denmark, the BBC's Gavin Lee reports. Arguments are raging over how much information to give consumers on the front of the pack. Food industry lobbyists fear an excessive administrative burden. Legibility is a key issue too, with the European Commission proposing a minimum 3mm font size for the lettering. German MEP Renate Sommer, who has drafted a report on the legislation, said the amount of information proposed by the Commission for food labels was excessive. Under the new rules, country-of-origin labelling may become mandatory for meat, poultry, fish, dairy produce, fruit and vegetables. Meat labels would also state exactly where the animal was reared. The Commission says food labels need updating because many shoppers now buy food on the internet and because food is packaged in new ways. 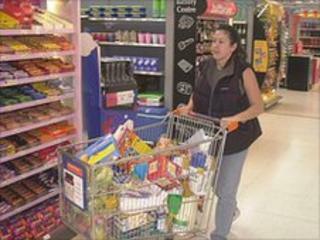 Advocates of clearer labels also point to rising obesity rates in Europe, saying consumers need help to make the right choices. "Traffic light" coding is already used by some supermarkets and the idea is backed by the European Consumers' Organisation BEUC. "Independent research tells us that the colour-code labelling scheme... is the system of labelling that shoppers find the most useful and easiest to understand," said BEUC director general Monique Goyens. The new legislation would include on the front-of-pack label the energy, fat, saturated fat and carbohydrates, with specific reference to sugar and salt content - all expressed as per 100ml, per 100g or per portion. A portion, however, needs to be clearly defined, argues Renate Sommer. She prefers "per 100ml" or "per 100g", saying consumers understand that better. Mandatory allergen labelling would be extended to food that was not pre-packed, including restaurant food. Once it is agreed, food producers will have three years to update their labels, and small firms with fewer than 100 employees will have five years to do so.